A new Report found that the annual wind energy cost in Ireland amounts to less than one euro per person. The new cost-benefit analysis concluded that wind energy is great value for consumers. Wind energy not only drives down the price of electricity but also cuts carbon emissions. 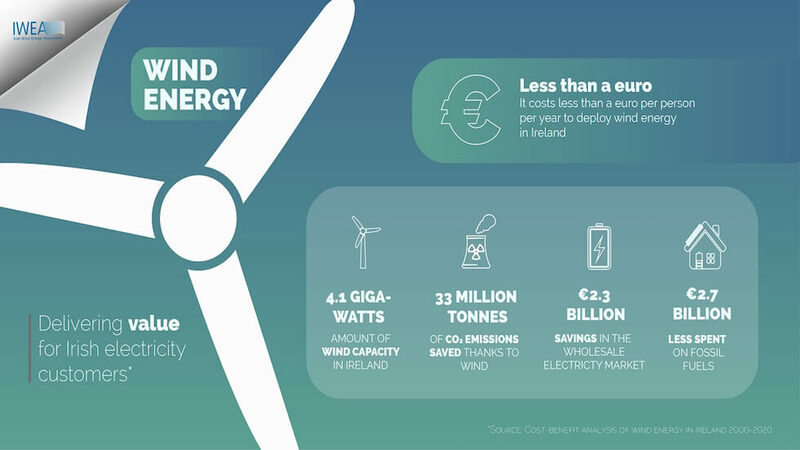 The report – ‘Wind for a Euro: Cost-benefit analysis of wind energy in Ireland 2000-2020‘ – was produced by energy and utilities consultants Baringa. The authors inform that, for Irish consumers, the annual net cost of wind energy has come to less than €1 per person since 2000. The authors analyzed Ireland’s electricity market from 2000 to 2020. They then simulated how that market would have behaved had there been no wind energy on the system. This is the first time researchers have used historical data to carry out a wind energy cost-benefit analysis. According to the Report, wind energy has delivered €2.3 billion in savings over the past twenty years on the wholesale electricity market. Wind energy has driven down prices for electricity consumers. It has also outweighed the total amount of funding the PSO levy provided to support wind energy. The Irish Wind Energy Association commissioned the Report. The authors of the Report included both the financial support for wind energy as well as the cost of additional investment. Specifically, investment in the electricity network plus the technical costs for accommodating wind energy’s variability on the grid. Over two decades, the cumulative wind energy cost came to €63 million. In other words, just sixty-six cents (€0.66, $0.76, £0.58) per person per year. Market Business News produced this easy-to-understand video which explains what wind energy is.